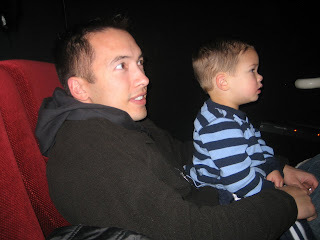 Yesterday we took Connor to the Northglen Theater to see his first movie "The Princess and the Frog". He was super scared when we first opened the door and walked in. The previews were playing and the screen was huge and the volume was turned way up. For a moment we thought our movie adventure would end right there at the door. Daddy carried Connor in and he settled down fairly quickly. Once the movie started we noticed that he was sinking into the seat and he was barely heavy enough to keep it from folding up on him. He ended up sitting in Daddy's lap the entire movie and was absolutely transfixed the entire time. He definitely is a movie fan. Who doesn't like a movie now and again. Looks like Connor likes them too.